Last Sunday, a group of students at the University Centre in Svalbard (UNIS) organised a baking competition – which they assumed to be the northernmost one, with rather high chances of being right. Fifteen teams came up with their masterpieces, competing in three different categories: best taste, best design/creativity and unexpected ingredient. It must be said that the level was pretty high, and the event attracted about seventy students to the third-floor kitchen of the Sjøskrenten student housing to be judges and vote for their favourite cakes after conscientious tasting. The Arctic Geophysics Master and PhD students, aka the Collisional Quenchers, proudly managed to get to the third place in the best design/creativity category! 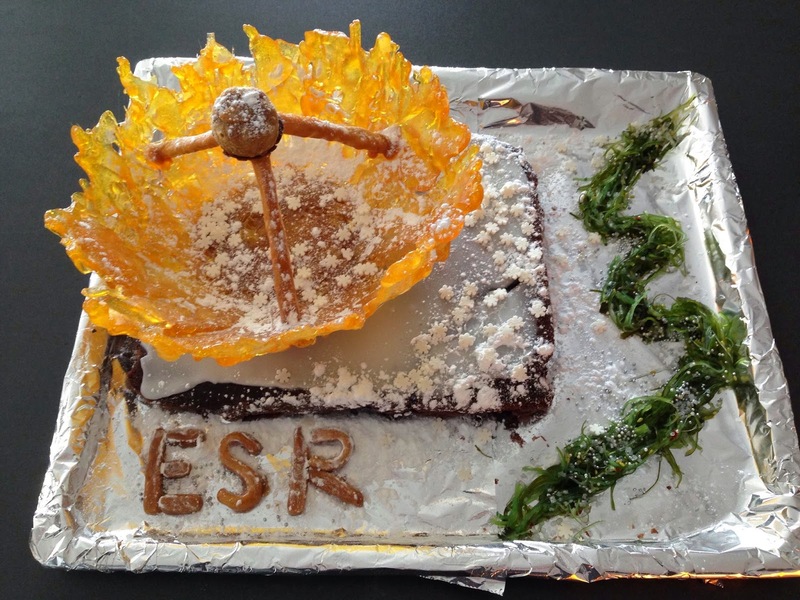 Their EISCAT Svalbard Radar (ESR) cake indeed made a great impression on the audience, although this could not compete with the very professional-looking Russian Mine Cake, by far ranking first. Had there been a nerdy category in the competition, though, they would surely have won! Rather unusually for Kilpisjärvi and completely unexpectedly for this of all days, the day of the solar eclipse dawned with clear blue skies and sunshine! What's more it stayed clear throughout the eclipse! A group of Spanish visitors also came along to view the eclipse from the KAIRA station and enjoy the spectacular scenery around. As the eclipse progressed, the light gradually faded, giving the appearance of the approach of sunset although the Sun was approaching it's highest, and the temperature cooled. Just ten minutes before maximum eclipse and everything was looking great. 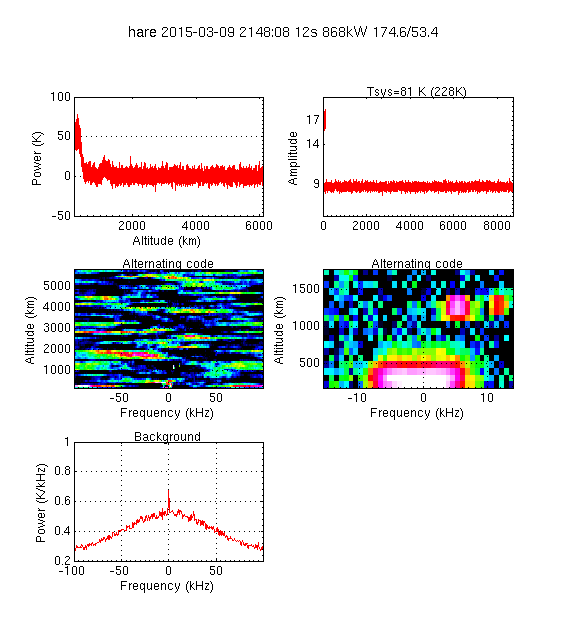 We lost more than two hours of KAIRA data from maximum until after the eclipse had finished. The data before and after look great and initial analyses suggest that it still could be a very interesting dataset. Which of course just makes the power outage at exactly the time it happened only the more frustrating. It's the morning of the eclipse on 20th March, 2015. It looks hopelessly cloudy in Sodankylä. Do I have to abandon the live webcast? Suddenly, my 7-year old daughter shouts that there're some blue patches between the clouds. Will the weather improve? Together, we have a look at two different weather predictions on-line: they disagree with one another. Time to call the on-duty meteorologist, who tells that there's a snow storm coming in and that the best chances to watch the eclipse will be to go to the western border of Finland. Time to pack up and drive towards Kittilä, stopping only briefly to drop my daughter off at her school. I call my colleague, who lives in Kittilä, and he tells it's snowing properly over there. I can only hope that it passes by the time I get there. Half there, in the area of the village of Tepsa, the snow storm hits. Almost a white out, visibility is low. Am I going to see anything at all? The phone rings. A journalist from Helsingin sanomat, who wants to know about our live webcast. Yes, we will do it, I tell him, if I can only find clear skies. He's somewhere south of me, heading to Kittilä, too, and has clear skies. He doesn't know about the snow storm yet. In Kittilä it's snowing lightly. Stopping on a supermarket car park, I have a look at the weather radar data on-line. It shows snow showers moving across Lapland from the North-North-West. If there's going to be clear sky somewhere, then that's the direction to go. Dive under the clouds and pop out the other side – hopefully. Alright then, let's go, set course to Muonio and continue driving. The phone rings again. My colleague has checked web cams in the area. Pallas shows clear skies and beautiful weather. I am driving in the right direction. Soon I can see it myself, the snowfall stops and there's blue sky in the North. Keeping going, I have some 45 min left before the start of the eclipse, and I need to set up the equipment, too. Somewhat in a hurry now, it's painful to stick to the 60 and 40-km/h speed limits across Sirkka, I am racing the Moon! Near the settlement of Pöntsö I find a nice, sunny lay-by, perfect, and I have more than 15 min time. I stop, position the car, set up the tripod, camera, lens, solar filter. Tether the camera to the laptop, connect the camera timer. Finally, I set the iPhone to work as a WiFi hotspot to upload the live images. Argh! Disaster strikes. In all the excitement I have forgotten to check the coverage. Only GPRS available here, not enough speed for uploading images, I need 3G! Quick, pack everything as fast as possible, and keep driving west. Course Muonio. Does the Moon know about 80-km/h speed limits? Driving with a keen eye on the reception indicator, I come across an elevated area, and soon there are four balls out of five next to the "3G" indicator. Great, now I only need a place to stop before the network fades again. There's a lay-by, and it's sunny, no trees in the way. Stopping and setting up again. It's dot on 11:08, the time of what's called "first contact", when the Moon's beginning to cover the Sun. Unfortunately, I've lost my race against the Moon, and the very beginning of the eclipse I've missed, but not by much. I set the camera timer to one photo per 20 sec and start my program, which centres the Sun in the final image. This is easy, and this time the technology works just fine. A quick phone call to my colleague confirms, the images are appearing on SGO's web page. Great, we are in business, now the only task is to reposition the camera every 6-8 photos or so. The Sun will move more than 30° across the sky during the eclipse. But then I see the battery indicator on the laptop, it seems to drain faster than expected. Well, it's cold, and the poor thing has to do image processing all the time. So I switch everything off that's not needed, including dimming the screen. Then I wrap the computer in a warm, black coat, thinking it's own heat will warm it, and the coat will soak up the heat from the Sun. But, hey, the Sun's fading! At maximum eclipse (pictured above), I finally check the images again – argh! Something in my script has started to do some automagic level adjustment, which leads to the black background becoming bright and noisy, which, in turn, causes the Sun-centering process to fail! Sorry about that, apologies to our viewers. But fortunately I've spotted it now and I am able to compensate by centering the Sun in the camera frame after every image. Some 10 minutes past the maximum, the Sun is bright enough again for my software to work fine, and the rest of the eclipse broadcast goes as planned. Phew! In the end, the laptop has 30% battery left, and I took some 412 photos in almost continuous blue-sky conditions. Amazing. Suddenly it hits me: I haven't eaten since my small breakfast. Time to pack and head back and find some food – and coffee! In the evening, back at home, I check the photos with my daughter, and wonder about the strange level adjustment, which happened between 10 min before and 10 min past the maximum eclipse. Finally I am able to track down the culprit: dcraw, the program that converts the raw images from the camera to something that ImageMagick can understand. By default, dcraw adjusts the levels of the images, and this default can be turned off by using option "-W". If only I had known that before the eclipse. Never mind, now I can re-calculate all the images, and see how it should've worked. Hmm... 412 images at 25 frames per second allows for a 16.5-second time-lapse of the eclipse: here it is. A bit wobbly, still, I need to improve my algorithm. But anyway, enjoy! Thanks to all of you who tuned in to watch the eclipse on SGO's web pages. I hope you liked it. I certainly enjoyed tracking it down for you! On Friday, 20th March 2015, there will be a solar eclipse, which can be seen as a partial eclipse (about 90% coverage) from Lapland if weather permits and it isn't cloudy. We will webcast the eclipse live as discussed previously. If the weather is cloudy, we will show the effect on the landscape, i.e. how dark it will really get. 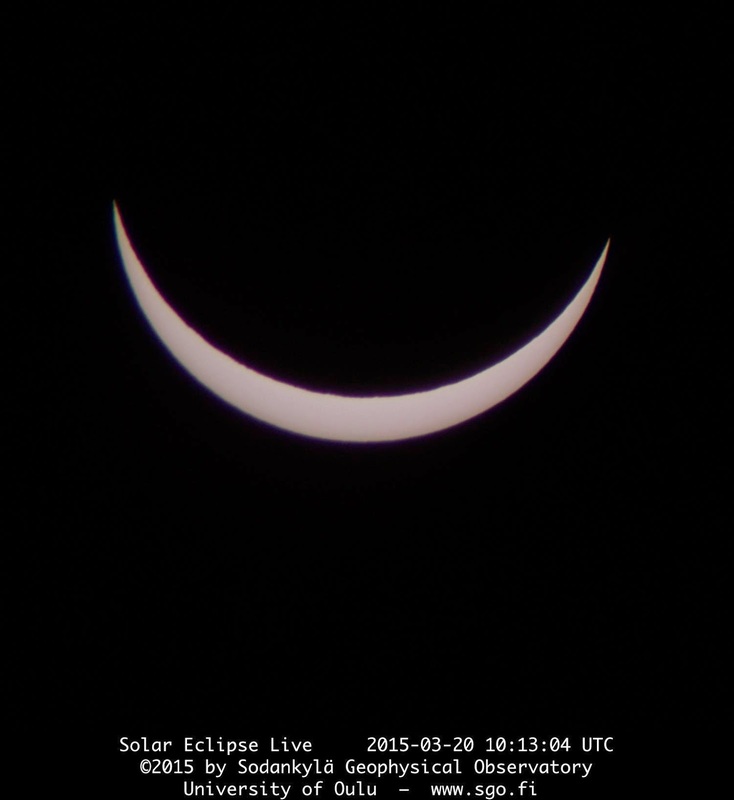 You can follow the event on our web server at this address: http://www.sgo.fi/Events/Eclipse. At Sodankylä, the eclipse will begin at 11:08 h and end at 13:18 h reaching its maximum of just over 90% coverage at 12:13 h (all times East European Time EET). The Royal Astronomical Society has a comprehensive guide on-line on how to watch the Sun safely, e.g. with filters or pinholes. Suomeksi: Tietoa pimennyksesta Suomeksi: URSA:n sivuilla. Pimennys voi seurata livenä osoitteella http://www.sgo.fi/Events/Eclipse jos pilvitilanne sallii. Lue myöskin Lapin kanssa täällä. 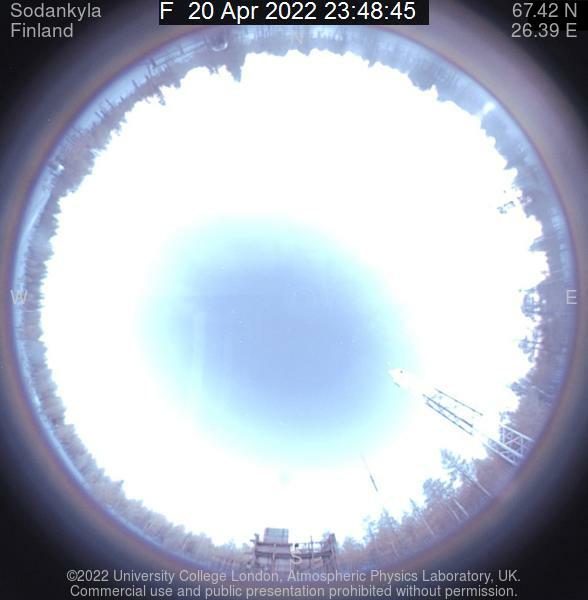 All day yesterday (17th March), the space environment around Earth was being blasted by a CME which launched from the Sun a few days previously. The solar wind speed measured just upstream from the Earth reached 500-600 km/s and the interplanetary magnetic field stayed southwards with values of -15-20 nT. 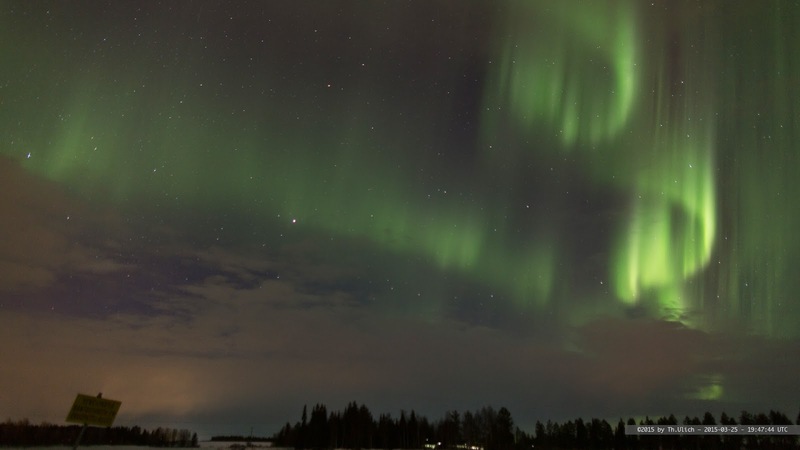 All this resulted in spectacular displays of aurora visible across the whole of Fenno-Scandinavia and at least as far south as Wales in the UK. Here at Kilpisjärvi it was, naturally, cloudy and snowing all night... However, KAIRA was observing as usual and the beamlet statistics indicate a very nice set of data! The plot is of data from all beams in the current standard background task experiment (including a number of riometry beams covering the sky, a beam on the strong radio source Cas A and a beam on the Sun or a pulsar depending on whether or not the Sun is up). The beam on Cas A is the most obvious as it is the one with all the scintillation! 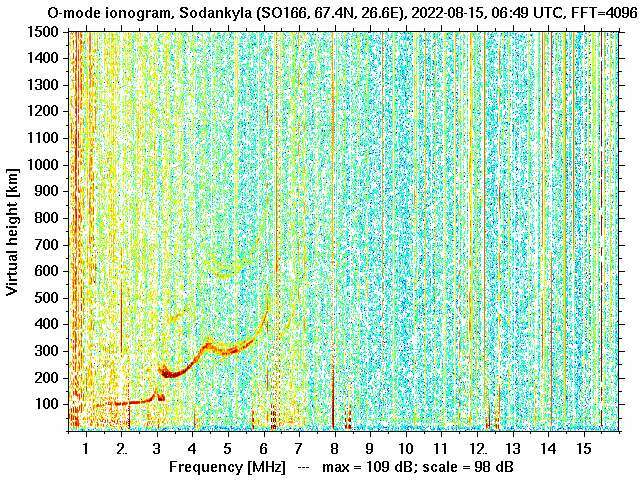 However, of great interest to a number of SGO researchers are the darker vertical stripes, consistent over all the beamlets (which means all the beams in whichever direction they're pointing). These are likely to correspond to strong riometric absorption events. Some of them can be seen to be "wobbling" a bit in time, indicating some movement of absorption patches across the sky. This will be a very interesting dataset indeed! On 20th March, 2015, there will be a solar eclipse in the Arctic. It can be seen as a total eclipse on Farøer and on Svalbard – weather permitting. 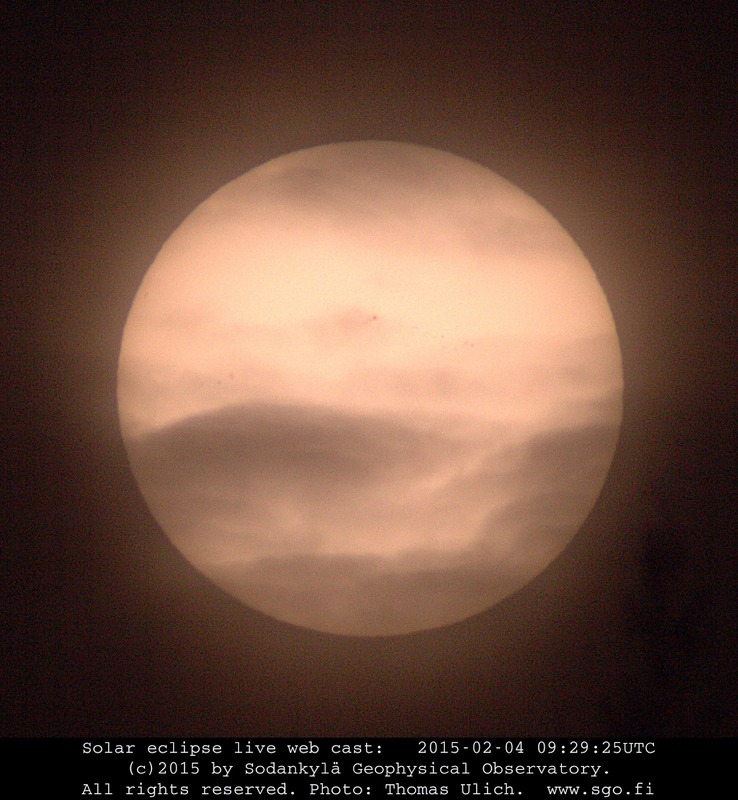 In Sodankylä, at the maximum of the eclipse, the moon will cover 90.1% of the Sun. The eclipse will start at 11:08 h, reach the maximum at 12:13 h, and end at 13:18 h (as computed using NASA GSFC's Fred Espenak's "Java Solar Eclipse Explorer"). There's also a map available. At SGO, we are working on a live webcasting project of the eclipse. The photo above was taken to test the equipment on 4th February, 2015, at the University of Oulu's Oulanka Research Station. Unfortunately a thin layer of clouds made focusing difficult. However, some small sunspots are clearly visible, and they have been verified against a visible-light image from the SOHO spacecraft. The setup will be as follows: a full-frame Canon EOS 6D will be tethered to a MacBook, and fitted with a 2x converter as well as a Tamron f/5.6 200-400 mm zoom lens giving an image of the Sun of a bit over 1000x1000 pixels. Most importantly, the lens opening facing the Sun will be covered with "AstroSolar" folio, which in Finland you can buy, e.g., here. NOTE: Do not look at the Sun without this folio! If you intend to use welding goggles, make sure they are at least factor 14 or darker (according to the URSA Astronomical Association)! The sunlight can destroy your eyes, and you won't notice it at the time of observation, but only afterwards. We plan on taking photos during the eclipse as fast as possible, but we will have to adjust the pointing direction of the camera ever so often, since the Sun moves fast across the field of view due to Earth's rotation. Thus today, I wrote a software, which will automagically find the Sun in the camera's RAW file, centre on it, cut it out at full resolution 1500x1500 pixels, place the time stamp and copyright information on it, and push it out to the web (see photo above, click to enlarge). There's a lot more information on this process over on my own blog. The address, you ask? Not decided yet, but of course we'll link it from our front page at www.sgo.fi and from this blog. Now, all we need is clear skies! Keep fingers cross that we'll find it not too far from Sodankylä!